Last night, I had a nightmare. I’ve been having them a lot lately, actually. I haven’t had a nightmare in at least 5 years, so, naturally, I want to explore this aspect of my subconscious. As you can probably tell from the title, my nightmare was about Lizzie Borden. In light of this, today’s urban legend post will be about the about the woman who allegedly murdered her father and step-mother with an ax in 1892. Andrew Jackson Borden was a successful businessman who manufactured and sold furniture and caskets. He was married to Abby Durfee Gray Borden, his second wife and step-mother to Lizzie and Emma Borden. Andrew Borden was not well liked in his town, or so was believed by his paranoid wife. According to Wikipedia, the Borden household was overcome with sickness for several days before the murders. It was believed to be food poisoning, but Abby insisted it was attempted murder. 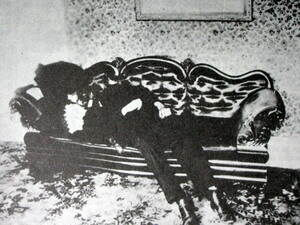 Abby and Andrew were found dead on Thursday, August 4, 1892. Lizzie found her father’s body in the living room and their maid, Bridget Sullivan, found Abby’s body in the second-floor guest bedroom. Lizzie claimed to have been out of the house for a half hour, while Bridget was resting in her bedroom due to feeling unwell. I did not find information as to where Emma might have been. Lizzie Borden was brought to trial for the murders in 1893. 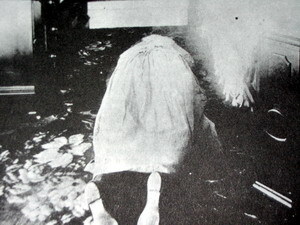 Due to lack of hard evidence – the murder weapon could not be confirmed and there was no bloody clothing – Lizzie was acquitted of the crime on June 20, 1893. No one else was questioned or arrested for these murders and they still remain a mystery today. And gave her father forty more. While these rhymes are delightful, they are, of course, exaggerated. Abby Borden was found with 13 ax wounds, while Andrew Borden only had 11. Since this story has historical documentation, it has not been varied much over the years. Therefore, the urban legend isn’t really an urban legend, but historical fact. Lizzie Borden remained in Fall River, Massachusetts until she died in 1927. Do you think she did it? Let me know what you think in the comments! This entry was posted on November 8, 2015 at 8:00 pm and is filed under Urban Legend with tags Horror, Lizzie Borden, scary stories, urban legend. You can follow any responses to this entry through the RSS 2.0 feed. You can leave a response, or trackback from your own site.